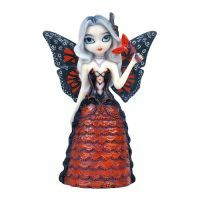 Jasmine Becket Griffith Valentine Masquerade Fairy Figurine  - $14.49 : Mystic Crypt, the most unique, hard to find items at ghoulishly great prices! Designed by Jasmine Becket Griffith (aka "Strangeling") 3 1/2" Tall and 2 1/2 inches wide, is meticulously crafted from cold cast resin and hand painted. Comes with gold string for decorating. This can be used as a figurine, or tie the gold string on it, to hang as an ornament. It does not have the circular top to put the string to hang it on, like most of the other ornaments by Jasmine Becket Griffith.